We had an evening in Chandigarh before we left for the Falachan valley. On the road from Delhi we talked of what we could see. Although I’d been to the city on work before, I’d seen nothing of it. So, when The Family said she wanted to see Nek Chand’s rock garden, I was happy to go along with the idea. The Young Niece had been there, done that, on a school trip earlier in the year, and she agreed that it was a wonderful place to go back to. Nek Chand’s story is fascinating. An untaught artist, he atarted creating a dream world exactly sixty years ago, illegally on land which belonged to the city. About fifteen years later, it was discovered, and the works would have been destroyed, had it not caught the imagination of the residents of the city. It remained as a project caught in a limbo between official acceptance and resentment, until the mid 1990s, when a trust was formed to take care of this art project. “Rock garden” is an inadequate description of this sprawling open art work. I thought of it as an imagined land. Partly landscaped waters and pavilions, partly peopled with fantastic beasts and people made from broken tiles, bangles and other scavenged materials. There were parts of this land which seemed completely abstract, for example the wall made with broken electrical fittings from the 50s. I thought that the nearest thing to this that I’d seen before were Gaudi’s works. This was partly accidental, because Nek Chand’s artistic vision was shaped by nature. But it was also partly because of the medium used: the use of trencadis, for example. The short time we spent here seemed inadequate, and we plan to be back on a longer trip to Chandigarh. 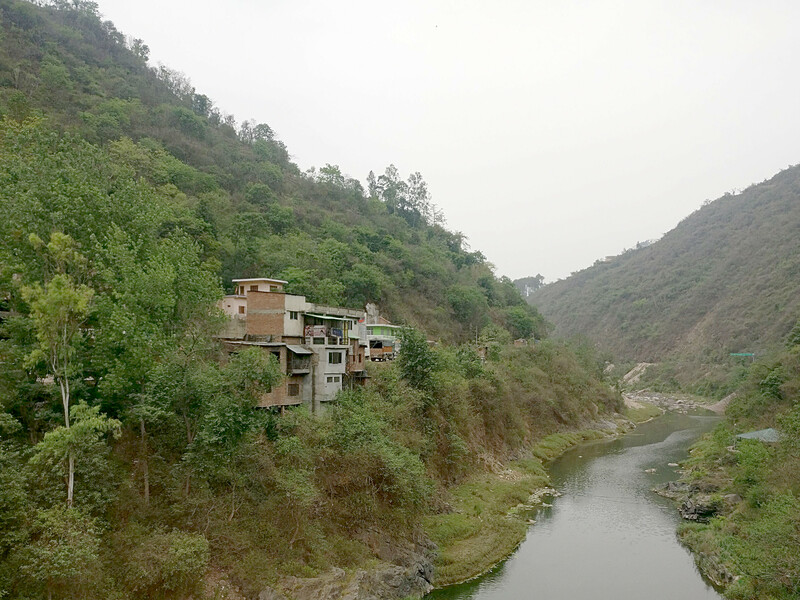 The drive from Chandigarh to the tunnel at Aut swings back and forth from near the Sutlej to the Beas: two of the five rivers which give rise to the name Punjab. This is an area of massive geo-engineering projects from two generations back. 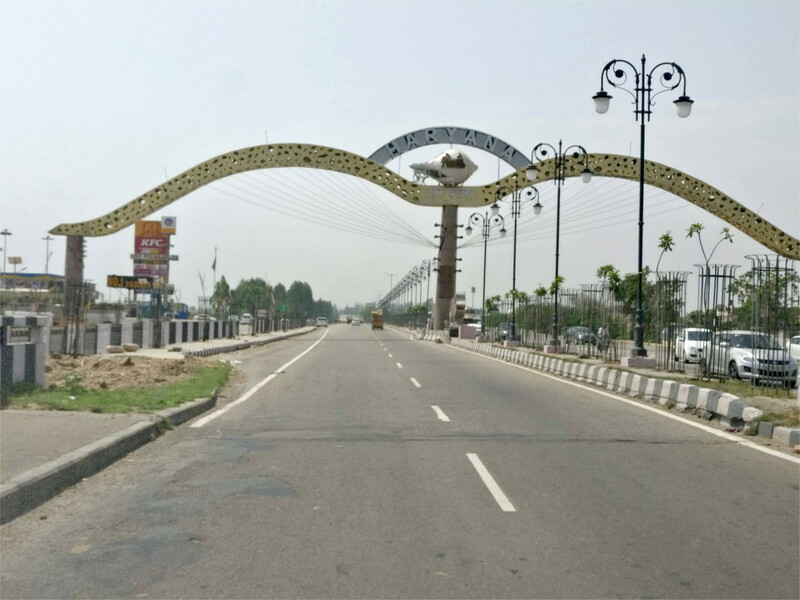 The city of Chandigarh can be considered to be one of these projects, since it was planned and built in roughly a decade. 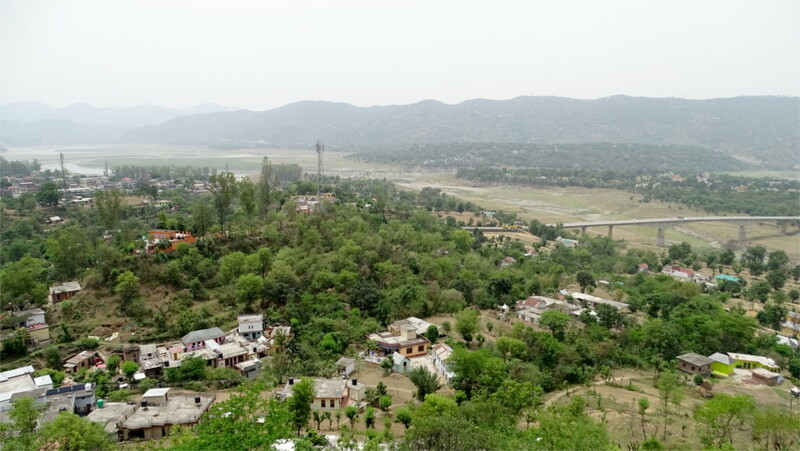 Our road up to Aut passed very close to the Bhakra-Nangal dams, one of the projects which was called a “temple of modern India” By Nehru, and which completely transformed Punjab’s agricultural economy. It turned out that the topography of the hills was such that we would not have a view of the dams. In fact, we seemed never to come very close to the Sutlej river; the featured photo is one of the closest views we had of the river. 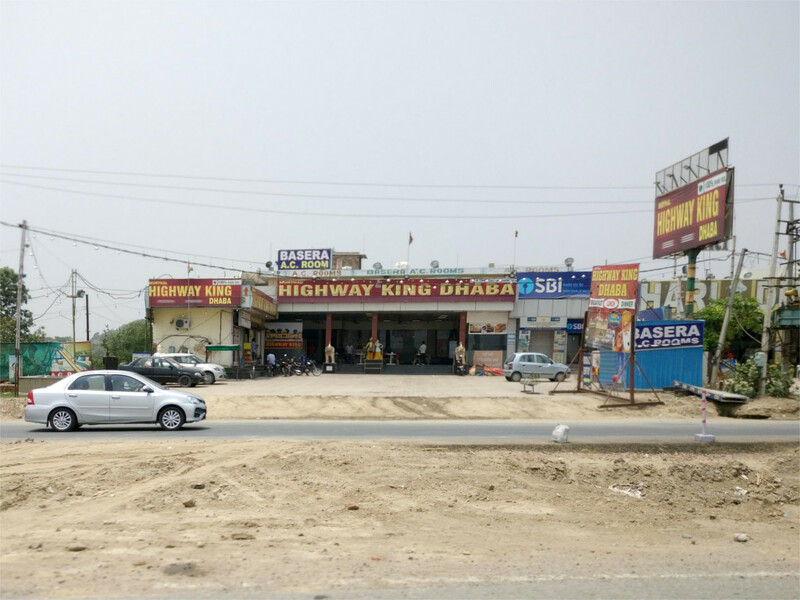 Soni, who was driving our car, stopped just outside Chandigarh at a petrol station. 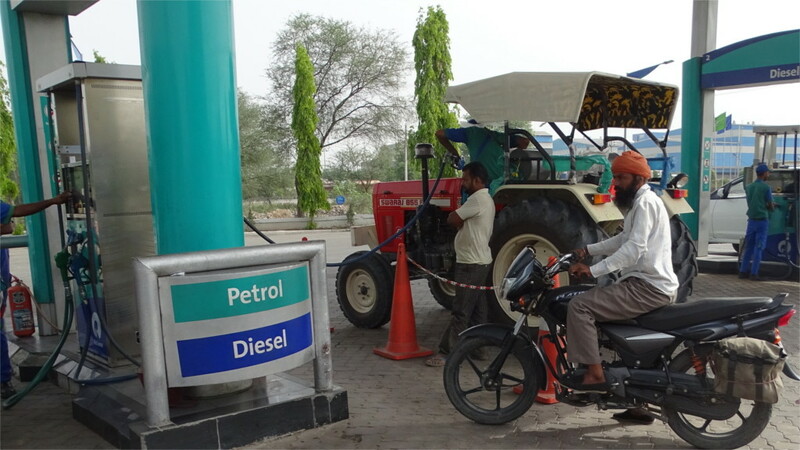 This was the heart of rural Punjab, and I saw a tractor pull up to the pump to refuel. That’s not something I get to see often. This part of the highway was full of tractors and motorbikes. These thinned out as we began to climb up the slopes of the Sivaliks. These are the foothills of the Himalayas, never rising beyond 3 Kilometers above sea level, but carved up into twisted ranges by meandering rivers. There was an abrupt climb immediately after we fueled, and we left behind the unseen lakes formed by the Bhakra-Nangal dam. We stopped for an early lunch. Across the road I could see a temple of contemporary India being built (photo above). We saw lots of them along the way. The older temples are off the main road, and require a bit of climbing to get to. 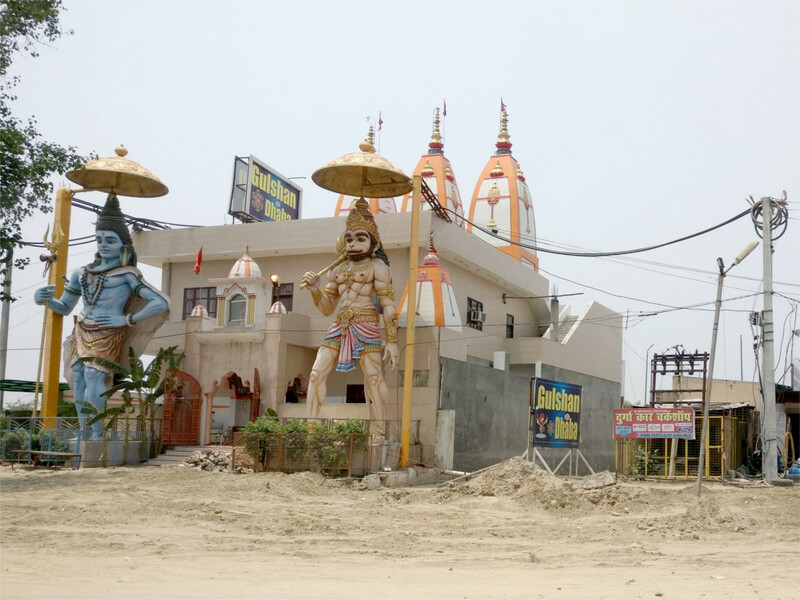 The new temples are all built to be easily accessible by car. A little market was growing up in this narrow shelf around the road. 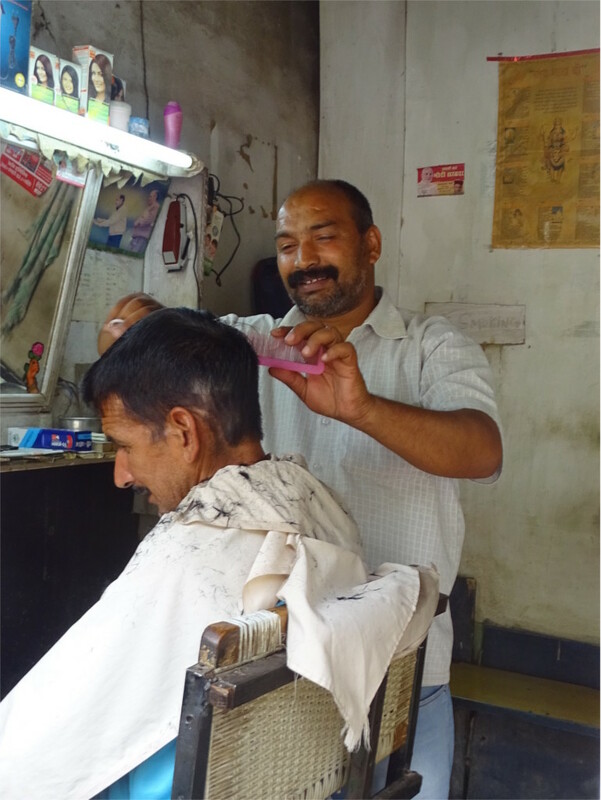 I poked my camera into a little saloon and caught the photo you see below. 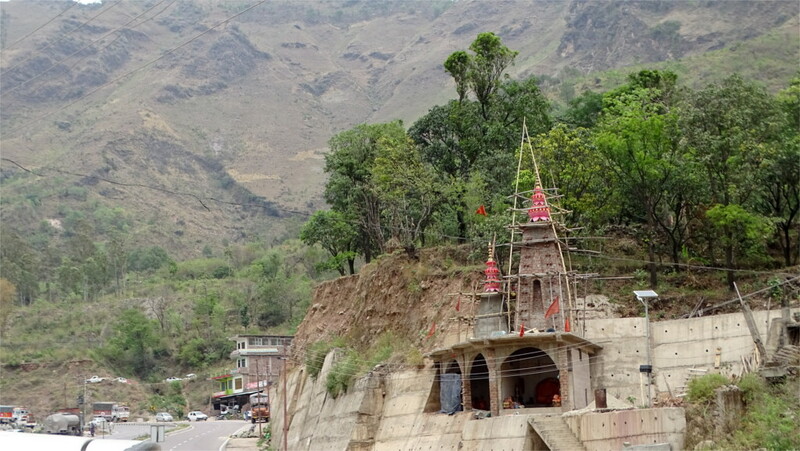 The road continued to stay close to the Sutlej. We would cross some of its larger tributaries every now and then, as the road jumped from one ridge to another slightly further north. Soni was one of the most uncommunicative persons I’d come across, but he realized that we were interested in rivers. So he stopped at a point where we had a grand view of a trickle of a river through a wide valley. A long bridge spanned the valley, but this was not the Sutlej. The far away glint of water which you can see in the photo below is the Sutlej. The external paint on walls also began to take on the colours of advertisements for paints that you see on TV. Do advertisements follow life, or the other way around? In these days of viral culture seeping through cables, the difference between life and ads is probably inconsequential. We forged on. I began to look for doors: not the metaphorical ones which we were headed for, but the honest-to-goodness doors which are the Norm. There was a profusion of windows, but precious little of doors. 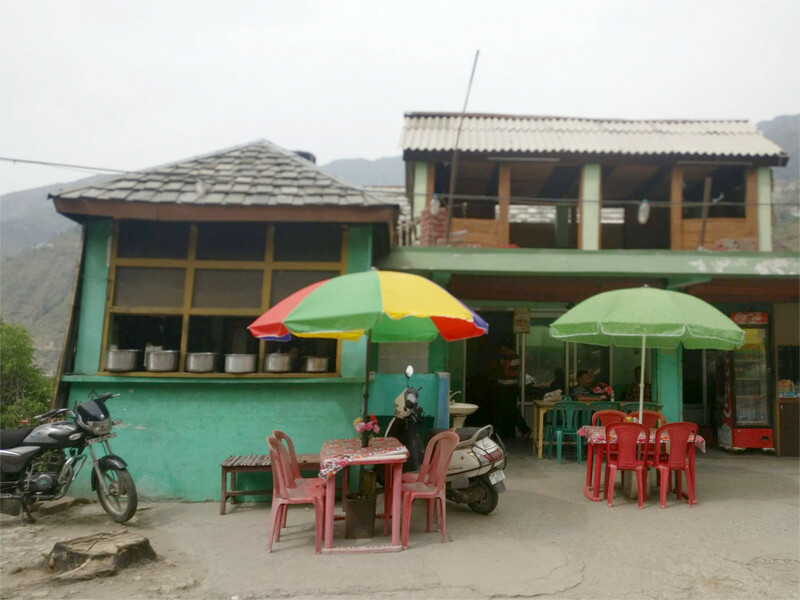 This roadside eatery, with its lovely rank of dekchis lined up on a counter is an example. There must be doors here, but they are lost in the gloom below the terrace. All I could see as we passed by were windows. Then, as we passed over yet another stream, The Family shouted something that could be “Eureka” or “Rubicon”. She had the map app on her phone active all this while, and it told us that we were crossing the Sutlej. From here we were headed towards the Beas. 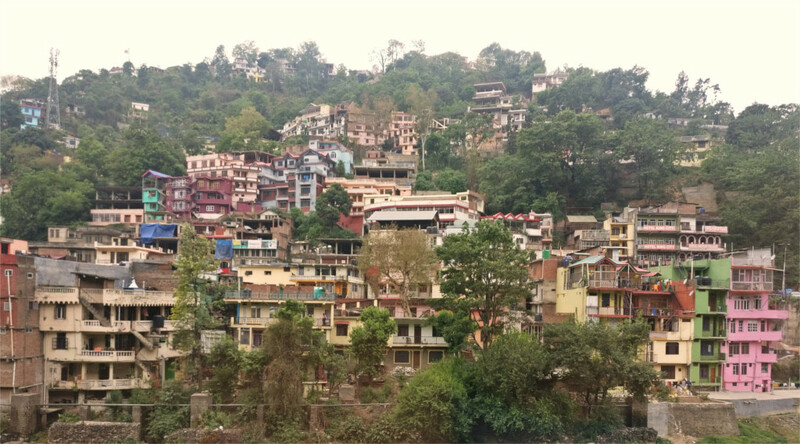 Soon enough, we reached the little district town of Mandi. 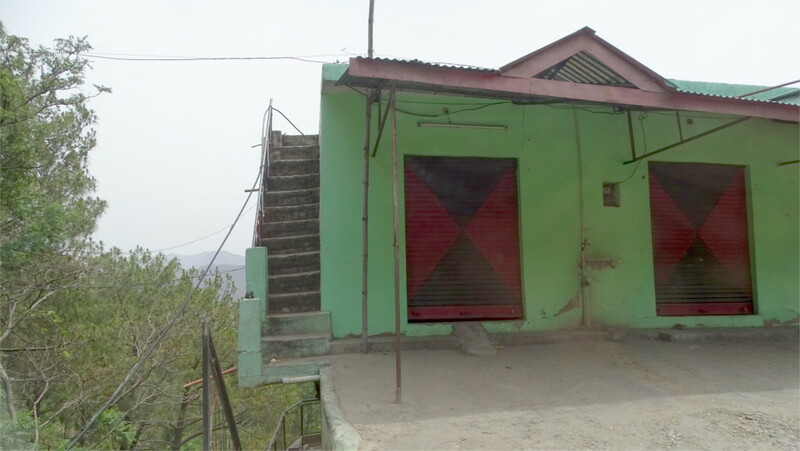 Mandi looked like a typical hill town: precarious structures leaning on each other, cut through by narrow streets, hemmed in by slopes. They spread laterally along slopes, rather than in circles around a town center. I liked the cheerful pink colour of the town. We’d originally planned to stop here for lunch, but we’d eaten already. So we sped by the town. We were almost a kilometer above sea level now, and the typical Himalayas houses began to show up along the road. Like in the photo above, you see a single story from the road. But if you walk up to the house, you would find another story or two below the road, snuggling into the slope. Often the level at the road is used as a shop or a garage. This one had its shutters down (doors at last!) but it was clearly neither. In no time at all we reached the last of the major geo-engineering projects along this road: the barrage at Pandoh. 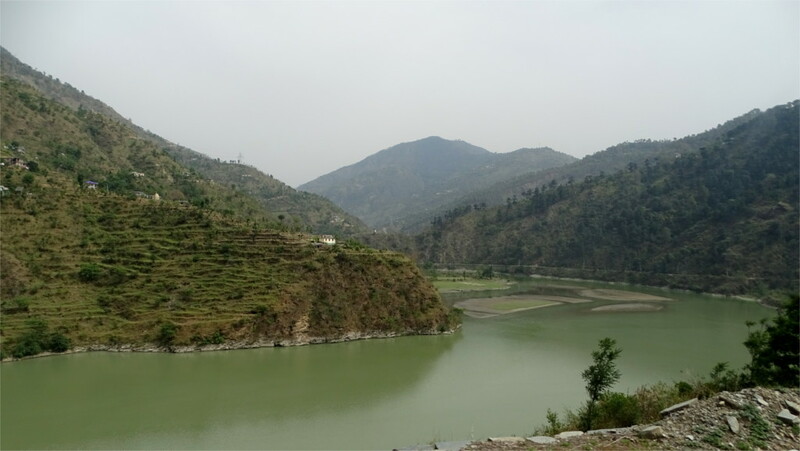 This connects the Beas and the Sutlej rivers, and utilizes the difference in altitude between them to generate electricity. The gentle Pandoh lake stretches behind the dam, curving through the valley which the Beas had carved out ages ago. The road went along the river all the way to the 2.8 kilometer long tunnel to Aut. This is truly the doorway to the high Himalayas, one which we would not push through. You cannot be in three places at once. So which of these three should one choose to visit on the weekend of Independence day: Amritsar, Lucknow or Madurai? All of them look interesting. The only way to choose is by elimination. In the last few days we managed to eliminate Amritsar. In the end the method was simple. I looked for flights from Mumbai to Amritsar. The only non-stop flights were by an airline in which we have, at least temporarily, lost confidence. A few months ago they had severe cash-flow problems and canceled many flights during vacations. They seem to have recovered partially, but are still on the edge. We would prefer not to take this airline. Moreover, the prices of tickets on these flights are sky-high! One of the flights with one stop takes a little over 5 hours one way. 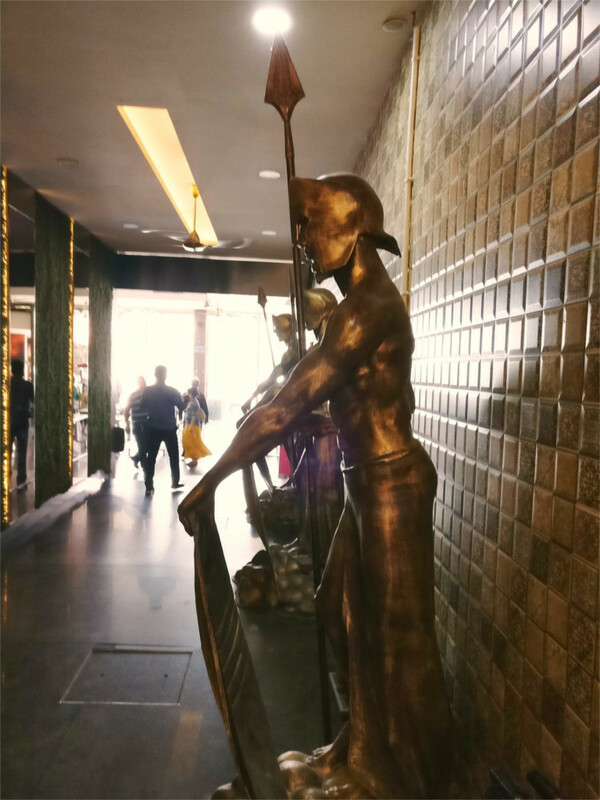 Most of the others involve long layovers in Delhi. This will take a day off our vacation each way. So that’s out too. The way most people do this, it seems, is to fly to Chandigarh and then take the road. The flight to Chandigarh takes two and a half hours. It looks like a 4 to 5 hours’ drive to Amritsar after that. The trip could well take 7 hours. This is no better than changing planes in Delhi. This more or less eliminates Amritsar. Its now a straight race between Lucknow and Madurai. Madurai is also out for the same reason. In principle it is possible to get from Mumbai to Madurai in about 5 hours, including time for a change of flights in Chennai. But its now too late to get such a flight. Now the only connections available are those which more or less eat up a full day. So Madurai is out too.